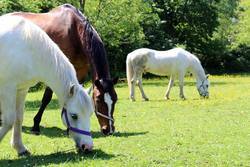 ​Our horses are all very different which is important as we are all different. Our horses work hard to make the stables what they are so we do our best to make them happy and look after their best interests. As a result we try to develop as much of each horses individual potential as possible. Our volunteers and riders take an active part in training the horses by helping with groundwork as well as ridden schooling exercises. Our horses are at all levels of training from those who are just broken to those who are used for BHS stage 2 and 3 training.